Hi. Before we get too deep into all this, how about a beer first? In fact, how about a FRIESE-GREENE ALE? I mean, anyone who has had a beer named after them must be important in some way, right? 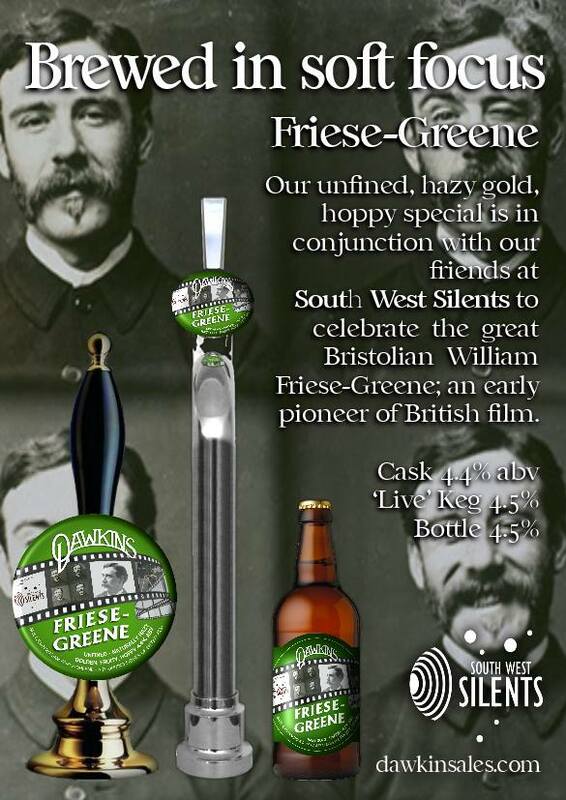 So what exactly is it that William Friese-Greene did that earned him this quaffable tribute and why was this beer launched as part of a festival of silent film in Bristol? Basically, at one time he was patriotically championed as THE inventor of motion pictures, a British-sized Edison, whilst for the last sixty years he has tended to be viewed as a scientifically incompetent con-artist who is about as responsible for the birth of cinema as your Gran is for the birth of hip-hop. The person most responsible for the myth-making is Will Day, a friend of William Friese-Greene during his later life, self-appointed torch-bearer after his death in 1921, and the first significant archivist of the early days of what we have come to call “cinema”. Then, in the other corner of the ring, is Brian Coe, who chose the centenary of Friese-Greene’s birth to lead the charge against the myth created by a poorly-researched biography and the movie made from it – “The Magic Box”. Brian Coe became a leading historian of photography, Curator of the Kodak Museum and a key figure in MOMI – the late-lamented Museum of the Moving Image – so people paid a lot of attention to him and continue to do so. I was just minding my own business really, living in Bristol in the early 90’s and pursuing my dream of becoming a film director, whilst engaged in assorted creative pursuits. But from time to time, I would pause in front of this discreet plaque outside a door on The Triangle in Clifton and wonder what it was all about. It sounded significant. Then I saw there was another plaque, by the Council House. But nobody seemed to know much about this guy, despite his having a third plaque in a cinema and another in Bath. For some enlightenment, my first port of call was riffling through Reece Winstone’s locally published series “Bristol As It Was” – full of photos from various eras, with explanatory captions, including quite a few references to Mr F-G. So then I got hold of a copy of the only book about him – “Close-Up of an Inventor” by Ray Allister – and I was simultaneously fascinated by the person it described and doubtful of the accuracy of what this volume contained. Discovering that “Ray Allister” was actually a woman called Muriel Forth whose only other contribution to literature was a book entitled “Manners For Moderns” reinforced those doubts. Nonetheless, this man had applied for over a hundred patents for all sorts of things – including airships, printing photos in magazines, X-rays, an advertising projection hat and a successful early form of photo-typesetting – and spent a lot of his life pursuing the dream of films in colour. He had gone from humble beginnings in the West Country to success and prominence in London, to bankruptcy and ignominy. An eternal optimist, he then went boom and bust twice more before dying in the middle of giving a speech at a meeting of film distributors. No wonder they made a movie about him – and no wonder it was a sad one. I was hooked. A great deal of what we know about the earliest days of moving pictures comes from accounts given by the protagonists – or those who knew them – decades after the events, making it hard to be sure of the exact truth. I can empathise with them because, reaching back over twenty years in my own memory, I can’t honestly say when my obsession with Friese-Greene began, but there is no question that somewhere in there it gripped me hard. I made the acquaintance of Andrew Kelly, who had recently set up the Bristol Cultural Development Partnership. He was a film buff and published writer who had a special interest in the silent era. The Centenary of Cinema was looming in 1995 and he was looking at ways to use it to put Bristol on the map, culturally. It seemed to me that I’d rediscovered just the kind of figure who would be of use to him, but Andrew was sceptical. He explained to me that in film historical terms, to carry on with this investigation would be to kick a hornet’s nest, which had been left undisturbed for years. He pointed me towards Brian Coe’s writings. I read them and felt as sceptical about their condemnatory conclusions as I had about the biography. It seemed clear to me that the truth either lay in between or in an entirely different direction. Andrew’s warning had merely emboldened me. I mean, in all great detective films there’s that bit where someone warns them not to investigate any further, but they do anyway, because they have to know, right? So now I was Sam Spade in “The Maltese Falcon” crossed with Jake Gittes in “Chinatown” crossed with… a bit of a nerd. Andrew Kelly, God bless him, quietly encouraged my madness by putting a bit of Bristol money my way to enable me to travel around to seek out Friese-Greene’s surviving family, search in the Science & Media Museum archives in Bradford and ultimately see some long-hidden materials in Paris. Accompanying me, sometimes literally, sometimes in spirit, was Stephen Herbert – another key figure in MOMI – whose very hands-on, get-back-to-the-original-sources attitude I found inspiring and related well to. So I hunted down those sources everywhere I could and tried to understand the technology, with his help. I never did get anything ready for the Centenary of Cinema in Bristol, I was still too deep in research. My only official contribution to that commemoration was getting name-checked a couple of times in a book published by the Cinémathèque Française, as I had inadvertently by then become a bit of an expert on some rather obscure corners of cinema history and had helped out their archive a little. Rather to my own surprise, some of the real experts in the field of early film history started to take my researches seriously and were willing to give a fair hearing to my ideas of what the true story of William Friese-Greene might be. One manifestation of this was being invited to give a lecture at a university about one aspect of my research, in front of a rather intimidating audience of people who seriously knew their stuff. This was a watershed moment – not so much because of the lecture but because a few months later it was pointed out to me that an established film historian appeared to have plagiarised what I’d said. As initiations into academia go, it was akin to being molested by your pervy uncle whilst your parents are out – and about as pleasant – but I figured it counted as an acknowledgement that I’d done some good work. Stephen Herbert encouraged me to start to write it all down by commissioning me to write a small book about an even more obscure inventor, John Arthur Roebuck Rudge, an early collaborator with Friese-Greene who set him on the path to trying to capture life and motion. Although we got to a second draft of the book, my insistence on further research and his running out of money to publish more books about interesting but obscure people meant it never happened. But he and Luke McKernan from the BFI did get me to contribute to their excellent Who’s Who of Victorian Cinema, which I’m happy to say is widely referenced on the Internet as they wisely turned it into a website. I was also contacted by the Oxford Dictionary of National Biography – the standard reference work for writers – to create a new entry on William Friese-Greene for the completely fresh edition planned for 2004. It was an immense privilege and a great compliment. They sent me the previous entry to read for reference. Written in 1927, it contained loads of errors and exaggerations. I looked at the initials at the bottom and immediately knew who it was: “W.E.L.D.” – Mr. Will Day himself. It was the strangest feeling of connecting back though time. In the end, I wrote my own film about William Friese-Greene in 2004 as part of a film development programme supported by Sony Columbia. Set in 1910 New York, the script contained nothing that was in “The Magic Box”, depicting a very different part of his story. Although I went to New York that year to research further and uncovered more fascinating information, the obsession abated as it became clear I couldn’t take that film project any further at the moment. I swear it was like a scene from some eighties sci-fi movie where a teenager opens up the closet to get his Bon Jovi t-shirt out and instead finds himself sucked into a spatio-temporal vortex which spits him out on the other side of the universe. For a month solid, I did little from rising in the morning to passing out in the early hours other than immerse myself deeper and deeper back into Friese-Greene, revelling in new discoveries and frustrated by the misleading ideas that are still common currency. Over a decade ago, the great collector and historian of early British cinema, John Barnes, exhorted me to write a book about what I’d found out, even though he didn’t agree with all of my conclusions. But I always knew it would be a lot of work for virtually no financial reward – if I could even get it published, that is. But now John is gone, I feel bad about never doing it. So this blog is a first step to starting to put some of this down, in the hope that if enough people seem to be interested I may get both the motivation and the opportunity to see it through, eventually. And to be clear: for me, this isn’t about who was first in this or that – I just think that William Friese-Greene is someone worth getting to know. In fact, I’ll drink to that. Cheers!